This is an example of how Russian Propaganda works. 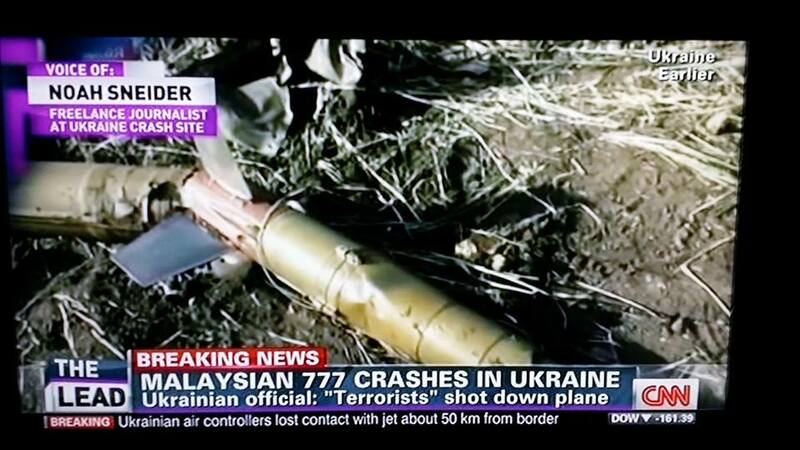 MH17 has been shot down. Russian terrorists arrive at the scene, either TOGETHER with Russian journalists, or the latter are informed and arrive a little bit later. Russian journalists shoot the footage, go back, make an item, broadcast it. Other journalists are denied acces for some time and get limited acces anyways. CNN wants to cover the issue, but does not have any journalists near, so they buy footage from a Russian News Agencie, because nobody else has this footage. The logo of this agency can be seen in the footage. Their website is here. The entire newsitem can be seen here. This not from the MH17 crash scene. Nobody saw it. None of the other journalists have seen it. Nor can this shot in any way be related to the crash scene. It is just a random shot. In the top right corner it says "Ukraine earlier", but all the footage from the crash site has this. It doesn not mean this shot is frome something earlier, but all the footage happened earlier in Ukraine and is not 'live' broadcasted. Beneath the photo it says: "The image that CNN showed yesterday would be rocket debris as it was found at the crash site of MH17." Next thing is that they call in experts asking them the question whether this is indeed a BUK-missile? So they answer: "Based on the image of the remains it does not concern a known version of the BUK-system. to us". Or to put it short: no, it is not BUK. But maybe it is a predecessor, they say. Of course this contradicts the story of the BUK. So maybe that story isn't true after all? Of course people notice the rocket and start to discuss this. And from here it is food for trolls, conspiracy theories and you name it. It also makes you think: how on earth do they get this shot so quickly in the footage? As if they had it already available for this. This is like a killer filming one of his murders, then selling the footage to a tv-station and getting paid for it. In the footage he includes shots that give him an excuse. He will continue to do the next crime, because he earns money from it.